Olympic Gold medal (front view). Paralympic Gold medal (back view). 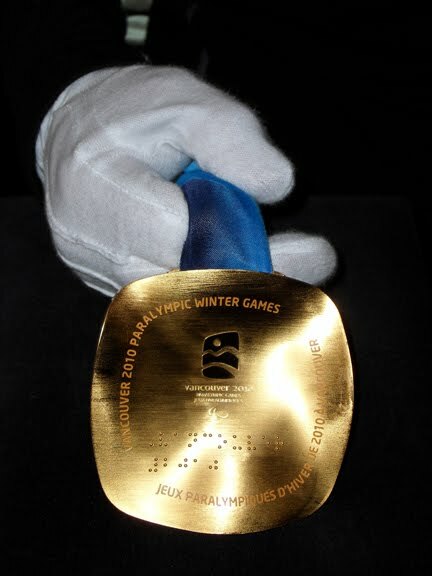 The braille on the back of the Paralympic medals reads “Vancouver 2010”. I heard a segment on the local evening news about The Royal Canadian Mint holding a limited-time display of the Vancouver 2010 athlete medals during the course of the Paralympics at the Vancouver Public Library. So the next day I went down to the library and stood in line with more than 300 people for 4 hours and 15 minutes. 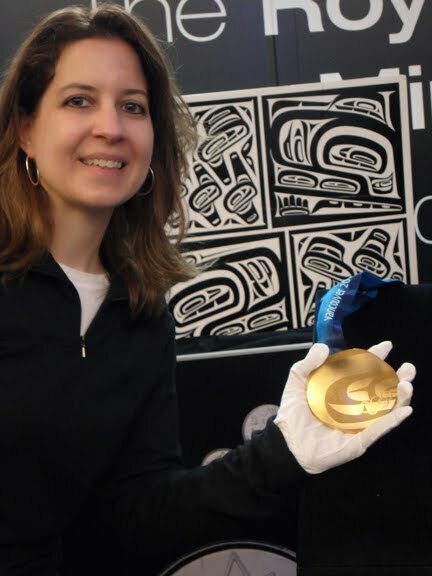 When I reached the front of the line I was handed a white glove because you are not allowed to touch the medals with your bare hands, for understandable reasons. Next, myself and 19 other people in line with me were led into a high-security room and given 10 minutes to look at, handle and take photos of the gold, silver and bronze Olympic and Paralympic medals. They were larger in real-life and much heavier than I expected. We couldn’t put the medals on. We couldn’t touch the medals with our bare hands. We couldn’t place the medals near our heart. Always inquisitive, I asked Alexandre, communications manager for RCM, about the rules and he said … they don’t allow the public to hold the medals near their chest out of respect for the athletes. And they don’t allow the public to pose with the medals in a manner which makes it look as though the person had won a medal. That is a privilege reserved for athletes only. The gold medal is actually a sterling silver medal plated with 6 grams (one fifth of an ounce) of pure gold! A small percentage of that gold comes from recycled metal (1.52 percent) reclaimed from end-of-life electronics (known as e-waste). The silver medal contains 0.122 percent silver e-waste. The bronze medal contains 1.11 percent recycled copper. The medals weigh 500 to 576 grams. The lightest being Olympic Bronze and the heaviest the Paralympic Gold. The Olympic medals are round because it’s a IOC rule. However, the IOC is flexible on the shape of the Paralympic medals, which are classified as “superellipse” shaped.